We live in a state where homeschool testing is required. Beginning in upper elementary, all the way through high school we have to test in varying degrees. Having to do this brings an added element to the homeschooling process. I have needed to spend time researching various tests that are acceptable to our homeschool regulations, and we have tried various tests (even ones not accepted by our state). In the homeschool community there is a debate concerning testing: To Test or Not to Test…That is the Question. Even among my local peers (who are all required to test per our NYS Homeschooling Regulations) there is debate over testing: how to go about it, how often to do it, how much emphasis to put on it, etc. Would I test if I didn’t have to? I’m actually not sure about this one. I think I would. “Testing” is a basic element of our society. We are tested all throughout our lives in various ways, and have to jump through hoops we might not have chosen to jump through ourselves as we navigate this world. How do I approach testing? I have chosen to make testing a normal part of our lives. While I don’t teach to a test, I do make sure my children have the knowledge and skills needed to be competent when homeschool testing comes around. Even though we only have to test alternating years from 4th-8th grade, I choose to test them every year, starting in 3rd grade. Starting a year early allows them to see the test and become familiar with how the process works. It allows me to see where they are going to fall on the testing scale before I will have to report their scores to our school district. During the years in which I do not have to report their scores, I don’t report them. I have them test just to keep it a normal part of what is expected, and to be sure we are staying on track with being competent in jumping through the homeschool testing hoop! 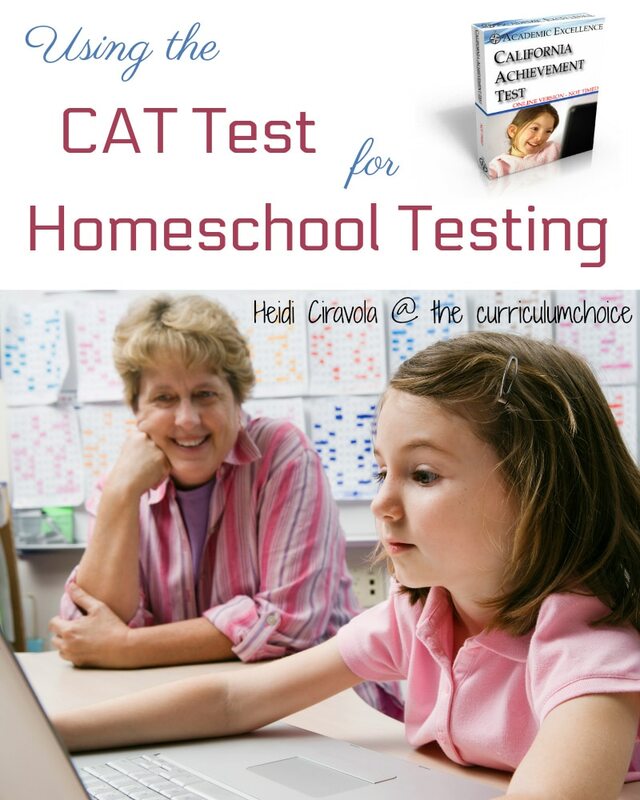 For years now we have used the CAT Test for homeschool testing. The California Achievement Test (CAT Test), for grades 2-12, is a nationally normed standardized test that measures achievement in the areas of reading, language, spelling and math. The CAT Test can be taken as a paper test mailed to your home (which you mail back upon completion), or as an online test done on your home computer. You can read more about the differences in these two here. The CAT Test is offered as both a timed and un-timed test. There is no degree required to administer the CAT Test.